Product #2604 | SKU AT4080 | 0.0 (no ratings yet) Thanks for your rating! The Audio Technica AT4080 active ribbon microphone gives you the unbeatably smooth, natural sound of a great ribbon mic — plus the kind of rock-solid reliability not always associated with a ribbon! Housed in a classically rugged, "suspension cradled" housing that resembles a side-address condenser microphone, the AT4080 flourishes in both studio and live environments. 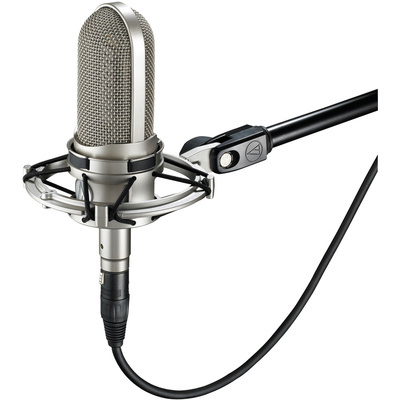 This mic's innovative, robust ribbon design makes it worthy of a long-term spot in your mic locker! Optimized for vocals, acoustic instruments, and orchestral frequency ranges, the fully bidirectional AT4080 is a rock-solid active ribbon performer! Delivering the warm, smooth sound of a classic ribbon microphone, Audio-Technica's handcrafted AT4080 active ribbon microphone offers a robust build for long-lasting, reliable performance and higher output for maximum compatibility with microphone preamplifiers. Equally at home in recording studios and live-sound settings, the microphone features Audio-Technica's innovative MicroLinear ribbon imprint, which protects the dual ribbons from lateral flexing and distortion. Audio-Technica's innovative ribbon transducer advances the evolution of ribbon microphone design! Audio-Technica's 40 series microphones let you capture great sound, and they let you do it the way you want. Designed from the ground up for premium performance, these 40 series mics are also built to keep on performing over the long haul — any of the great mics in this series makes a perfect addition to your mic locker! Best of all, these 40 series mics provide top-shelf A-T quality that's suitable for elite studio facilities — at prices that put them well within your reach! Max input sound level: 150dB SPL, 1kHz at 1% T.H.D.